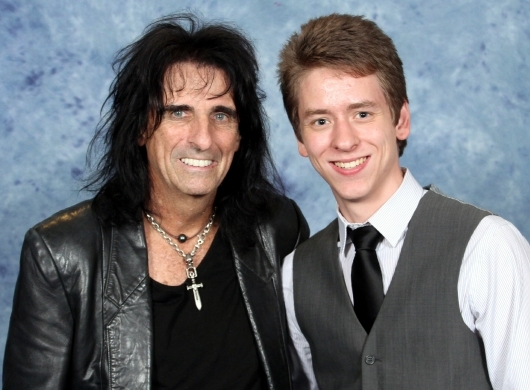 I met Alice Cooper at the Dragon Con held in Atlanta, Georgia, in September 2012. He was very friendly, and not at all scary! 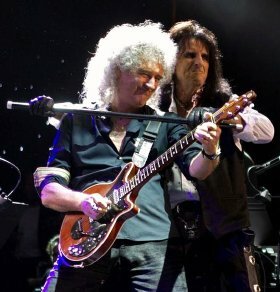 We shook hands and exchanged a few words before I had this photograph taken with America's rock legend. Middle School, before finally graduating from the Cortez High School in Phoenix. team mates into entering a local talent show. 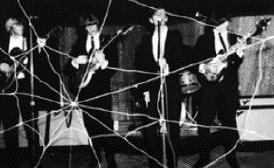 Calling themselves The Earwigs, they based their performances on The Beatles, an English band from Liverpool which, by 1963, had become all the rage. They even dressed like them, and performed Beatles songs. 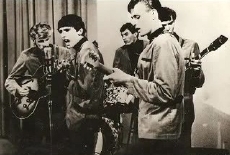 school and recorded their first single Why Don't You Love Me in 1965. They had a local No.1 radio hit with their second single Don't Blow Your Mind in 1966. 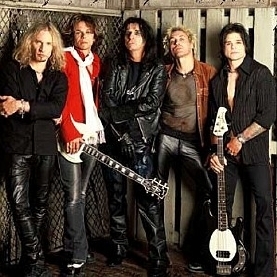 The following year, they moved permanently to Los Angeles where they performed regularly. 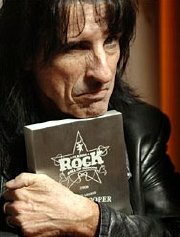 discovering that there was already a group called Nazz, Furnier chose Alice Cooper as the band's new name, and later adopted it as his own. For this, he still pays an annual royalty to the other band members. Ballad of Dwight Fry and Is it My Body. 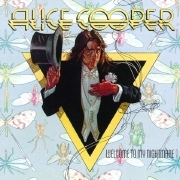 1972 also saw the release of title track single from their fifth album, School's Out which became Alice Cooper's first major hit single, reaching No.1 in the UK singles chart for three weeks. They followed it up with their most commercially successful album, Billion Dollar Babies (1973), which also reached No.1 in the US and UK. 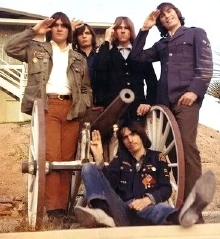 Arguments amongst the band members led to it eventually disbanding. 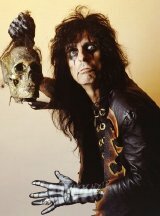 Furnier moved to Los Angeles to pursue a solo career as the wildly outrageous Alice Cooper. 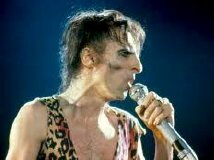 He is often referred to as the founder of 'shock rock' due to his gory, theatrical performances, which included simulating his execution on stage, or wrapping himself in his pet boa constrictor. Harry Nilsson. Their aim was to outdrink the other members! Drink plagued Cooper's career for more than five years until 1983 when he finally became clean and sober. He took a year off to spend time with his family and to improve his golf skills. He also starred in the Spanish B-movie Monster Dog (1985). Diamonds (2005), and his most recent Welcome 2 My Nightmare (2011). Many of these album releases have been followed by extensive tours of America, Europe and other parts of the world. 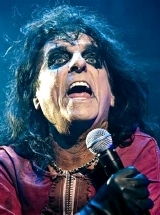 Throughout his career, Cooper has used the same distinctive, scary image along with his gruff singing voice, his jet black hair, black leather jacket and trousers, with his face made up with black grease paint around his eyes and mouth. Schizo in Prince of Darkness (1987) and Samuel Leventhal in Horror in the Attic (2001). His most memorable appearance was when he played himself in the comedy Wayne's World (1992). 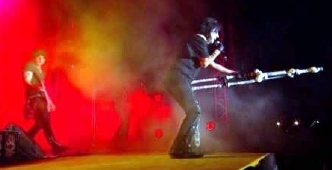 given a star on the Hollywood Walk of Fame in 2003 and received a Rock Immortal award at the 2007 'Scream' Awards. 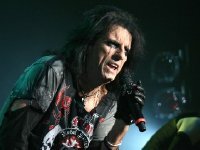 honorary degree from Grand Canyon University and in 2006 was given the key to the city of Alice, North Dakota. 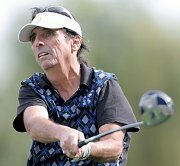 He was inducted into the Rock and Roll Hall of Fame in 2011.
title Alice Cooper, Golf Monster: A Rock 'n' Roller's 12 Steps to Becoming a Golf Addict. Williams and Bill Turnbull. He has also appeared in commercials for everything from office supplies (Staples) to televisions (Sony and Samsung), car dealers (Airpark) to car tyres (Bridgestone) and TV broadcasting (Sky) to hotels (Marriott). 1982. They remain married after 36 years and have three children - two daughters Calico (b.1981) and Sonora Rose (b. 1993), and a son Dashiell (b. 1985). 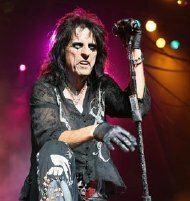 On his left wrist, Alice Cooper wears a silver bracelet which can only be removed with a key possessed solely by his wife! 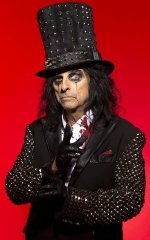 Alice Cooper says, "On stage, I'm this figure, this actor, who does things that people aren't used to seeing, and I relish that reaction. But in real life I play golf, I shop, I walk around with no makeup on and my hair in a pony tail. I may not be the typical middle-aged Joe, but I'm closer to normal than you think." (1992). He also has over seventy soundtrack credits, and has appeared as himself in many different TV productions. to the successful singles Under My Wheels and Be My Lover in early 1972.